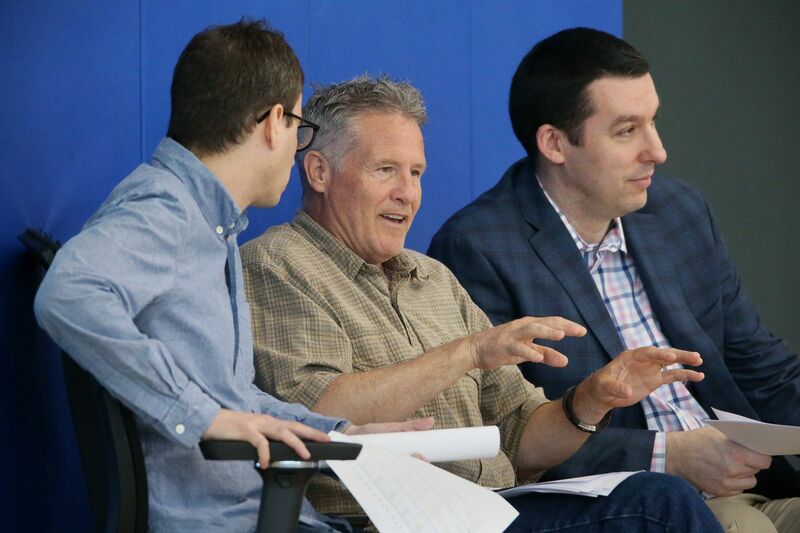 The Sixers' acting front office, headed by Brett Brown (center), is shaking up the scouting department. The 76ers have yet to hire a president of basketball operations/general manager. But that hasn't stopped them from shaking up their scouting department. The team hired J. R. Holden as an international scout. The Pittsburgh native spent the past four years as the Detroit Pistons international scouting director. He'll officially start working for the Sixers on Aug. 15. Meanwhile, the team parted ways with longtime scout Mike VandeGarde as a way to streamline the scouting process. While live-game scouting will still be a priority, sources say the team wants to put a heavy emphasis on watching video of prospects. Strong proponents of gender equality, the Sixers are also making a push to hire a qualified female scout, according to sources. For now, Holden brings a solid international-basketball background to the organization. The Pittsburgh native had a standout professional career in Europe after going undrafted by NBA teams out of Bucknell in 1998. He played in Latvia, Belgium, and Greece before playing for CSKA Moscow in Russia from 2002 to 2011. Holden led CSKA to EuroLeague championships in 2006 and 2008. He was named the VTB United League Final Four MVP in 2010. He was also named to the EuroLeague's 2001-2010 All-Decade team. Holden, who has dual citizenship for Russia and America, is a former member of the Russian national basketball team. The 41-year-old still has plenty of ties to international basketball. Meanwhile, the Sixers' search for a president of basketball operations/general manager continues to drag on. The Sixers have been without a full-time person in the position since Bryan Colangelo resigned on June 7. His resignation ended a stunning nine-day saga that began when a report from The Ringer tied him to damaging and anonymous Twitter accounts. Sixers coach Brett Brown is serving as the interim general manager.